This bride and groom chose the perfect place to say I do, Wine and Roses in Lodi, CA. The grounds of this lovely hotel are lush with botanical gardens and towering trees. The bride looked amazing in her ivory lace dress carrying a classic clean bouquet of white roses, pink mini calla lilies, and mini white cymbidium orchids. Her groom, dressed to impress in his grey tux wore a simple boutonniere, a mini white cymbidium orchid. 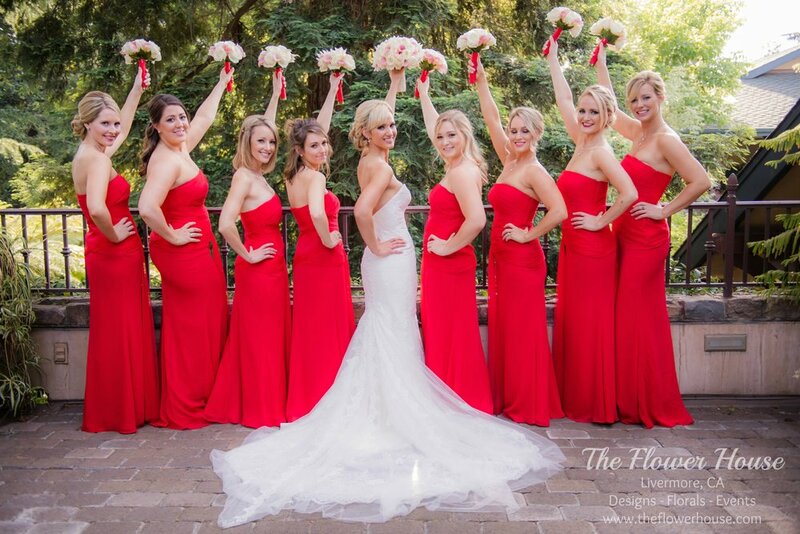 The bridesmaids wore bold and bright red dresses and carried simple elegant bouquets of white roses and blush pink mini calla lilies. The outdoor ceremony had a beautiful backdrop of lush greenery, the perfect bride and her groom were married under an altar decorated with smilax garland and tucked in spray roses, topped with a beautiful spray of hydrangea, roses, tea roses, and orchids. The aisle was lined with a romantic scattering of white rose petals. Photo credit to Julien Cole Photography.